FHE Health takes a holistic approach to behavioral health treatment, which means it doesn’t just concentrate on substance abuse disorders. Often, addiction has ties to mental health disorders, and the team at FHE Health is experienced in treating co-occurring disorders and understanding the role that mental health may play in both daily life and in drug or alcohol abuse. Dr. 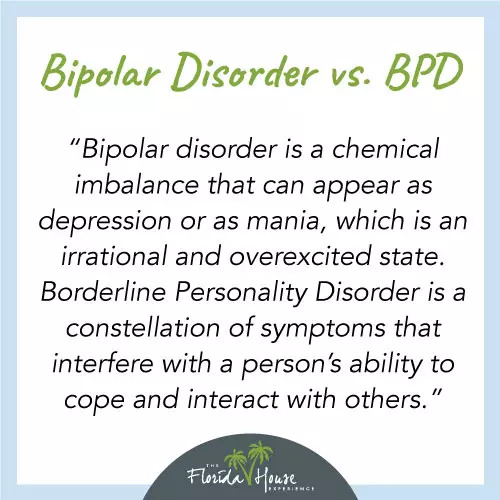 Beau A. Nelson, DBH, LCSW and Director of Clinical Services at FHE Health provides some information about both Borderline Personality Disorder (BPD) and bipolar disorder, including approaches for treating these disorders and their potential impact on alcohol or drug addiction treatment. Dr. Nelson says that it’s not currently believed that BPD is just chemical but rather that it is psychological in nature. That differs from bipolar disorder, which is chemical — meaning the brain doesn’t function properly because of an imbalance of certain elements. For this reason, finding the correct medication protocols for an individual and ensuring the person remains compliant with medication is critical to successful treatment of bipolar disorder. In the case of BPD, medications may be used to treat symptoms but not necessarily the root cause of the disorder. Dr. Nelson notes that there isn’t a specific link between the two disorders. In fact, even having the two disorders together is rare. This is one reason it’s essential to talk to a trained mental health professional when you’re experiencing symptoms that might be behavioral in nature. Finding the right diagnosis is critical to getting the right treatment, but to the untrained eye, some of these disorders may appear similar or related. Is There a Spectrum for These Disorders? Any mental or physical health condition can present with varying severity, says Dr. Nelson. When it comes to BPD or bipolar disorder, he notes that “some people might have smaller issues that interfere with their functioning while others are almost completely incapacitated” if their condition is not treated in some way. For this reason, there are different levels of treatment for both of these disorders. Individuals who have their disorder under control with medication or simply don’t experience extreme disability because of their disorder might be able to manage the condition with individual therapy. Typically, this involves seeing a licensed clinical social worker or psychiatrist periodically. The individual’s own treatment plan and professional recommendations provide for the schedule of therapy, which can range from once a week to a few times a year. For more severe cases or in situations where a person is losing control of their life or has turned to unhealthy coping mechanisms such as drug or alcohol abuse, more intensive therapies may be required. That might include intensive outpatient therapy or residential treatment in an inpatient program. What Is the Impact of Drug Use on These Conditions? Drug use is damaging to the brain under any condition, says Dr. Nelson. Most drugs cause chemical changes or reactions in the brain, damaging both the cognitive matter itself and the brain’s ability to communicate effectively with the rest of the body. This is because drugs act on the neurotransmitters in the brain (that’s what the brain uses to handle all that communication). When you combine a condition that involves a chemical imbalance in the brain such as bipolar disorder with drug or alcohol use, you can exacerbate the impact of both issues. In some cases, individuals with BPD or bipolar disorder start abusing drugs or alcohol as a way to self-medicate to address the symptoms of their mental illness. This can ultimately make their mental health condition worse and add an addiction to be faced. FHE Health doesn’t specialize only in mental health or only in substance abuse treatment. The teams provide holistic treatment that addresses the entire person. If you’re struggling with an addiction complicated by mental health issues (or vice versa), you can find treatment that takes the big picture into account. That results in an increased likelihood for long-term success and prepares you for sobriety and compliance with mental health treatments when you return to regular life. The therapists, doctors, and others at FHE Health work with every individual to understand exactly what treatment methods may work for them. Methods might include options such as cognitive behavioral therapy, neuro-rehabilitation, and even medication. An important factor in treatment that takes the entire person into account is that therapists and doctors understand how any addiction or drug use may impact medical treatments. They can work specifically with patients to ensure mental health medication regimes align with sobriety goals. Whether you’re experiencing mental health symptoms or struggling with addiction — or both — timely treatment can help pave the road to recovery. Contact FHE Health today to learn more about treatment options for BPD, bipolar disorder and addiction.